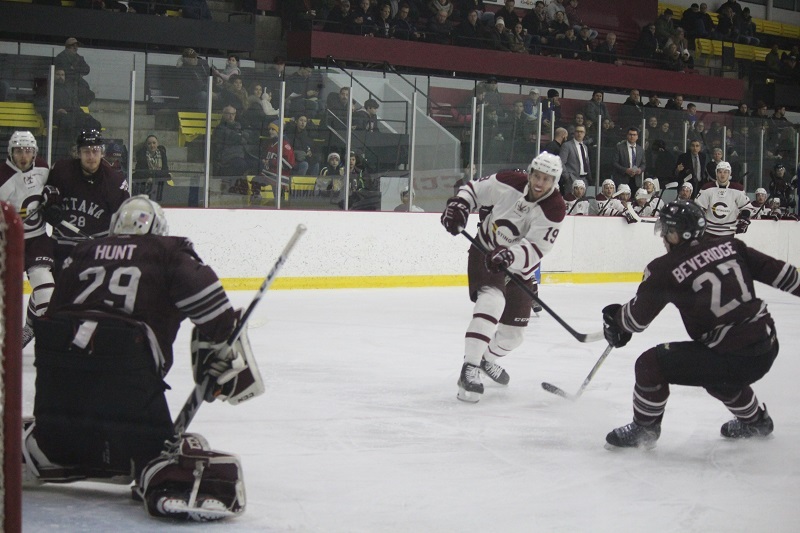 The Concordia Stingers men’s hockey team lost 3-2 against the Ottawa Gee-Gees on Feb. 2 at the Ed Meagher Arena. A late shorthanded goal by Gee-Gees forward Quinn O’Brien handed the Stingers their third-straight loss. The Stingers were without head coach Marc-André Élement, who was serving the first game of a two-game suspension. Assistant coach and Élement’s doppelganger, Kiefer Orsini, took over the head coaching duties for the game. He said miscommunication led to the Gee-Gees’s winning goal, which came with two minutes left. The Stingers opened the scoring early in the game, with forward Massimo Carozza finding the back of the net off a pass from forward Anthony Beauregard. That was Beauregard’s 56th point of the season, the most in the country, and it extended his point streak to 14 games. Forward Raphaël Lafontaine doubled the Stingers advantage late in the period, scoring on a rebound of a shot from Carl Neill. The Gee-Gees started climbing their way back into the game with a strong second-period performance. They outshot the Stingers 12-8 in the second, and Stingers goalie Marc-Antoine Turcotte made some key saves to keep his team’s two-goal lead. He couldn’t hold the fort forever though, and an Ottawa forward finally solved Turcotte with a late powerplay goal to cut Concordia’s lead in half. Stingers forward Anthony Beauregard extended his nation-leading points total to 56 points. Photo by Alex Hutchins. Ottawa tied the game early in the third period, with forward Connor Sills redirecting a pass from Mathieu Newcomb past Turcotte. The third period was rather mundane, with neither team generating much offence. The Stingers took six shots in the third, while the Gee-Gees took three. Hudon said the Stingers didn’t stick to their gameplan after the first period. Coming off three-straight losses, including four in their last five, the Stingers head on the road to face the Royal Military College of Canada (RMC) Paladins on Feb. 3. The Paladins are tied with the Université du Québec à Trois-Rivières Patriotes for the eighth and final playoff spot, while the Stingers sit in fourth place, two points behind the third-placed Carleton Ravens. Both the Stingers and Paladins have three games remaining.